As promised, here is my weekly soup recipe. A hearty Tortilla Soup that is very easy to adapt to all tastes and requirements (a daily hurdle for me). Start with some good chicken stock, or in my case “No chicken, chicken stock” really, that’s what it is called and it tastes just like chicken stock. It can be chock full of black beans, if you like them of course. Some corn, okay who doesn’t like corn? For the whole Mexican thing. Tomatoes slow roasted in the oven , to add a nice smoky depth. A jalapeno for just the right heat. Also wouldn’t be Tortilla Soup without some crispy tortillas piled on top, right? Add some chopped ripe avocado for creaminess. To finish, a good squeeze of lime and a handful cilantro and scallions. I made a vegetarian version (for my bunny), cooked chicken separately then added to the bowls of those who wanted (my carnivores of course). Toss halved roma tomatoes with about 1/2 of the olive oil, sprinkle with salt and pepper and roast at 400 degrees for 20-30 mins. Meanwhile add the rest of the olive oil to large stockpot and add onion, celery, peppers and a sprinkle of salt and pepper. Cook on medium high heat until onion and peppers are soft about 6-7 mins. Add garlic, saute for another minute or so. Now add all the spices and stir around in the onion mixture a bit. Add the stock and bring to boil then reduce to simmer. Remove tomatoes from oven and chop up, add to stock pot. Add the black beans and corn, cook another 5-10 mins or so. Add chicken to soup now or cook separately and add to individual bowls when serving. Chop up tortillas and toss or spray with olive oil, bake at 400 degrees until crisp and just beginning to brown at edges,remove from oven and sprinkle with salt. Just before serving add the juice of 2 limes. 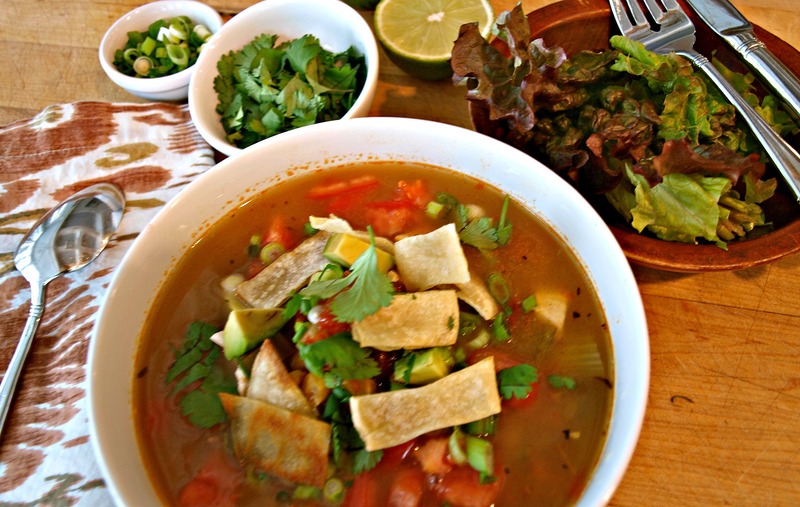 Ladle soup into bowls garnish with cilantro, scallions, tortillas and avocado.